This Crock Pot Mac and Cheese is an easy and delicious dinner loaded with cheddar and Colby Jack cheeses and perfect for a weeknight meal or cozy weekend dinner! This Crock Pot Mac and Cheese Recipe is sponsored by Cabot Cheese and Vermont Tourism, all opinions are 100% my own. 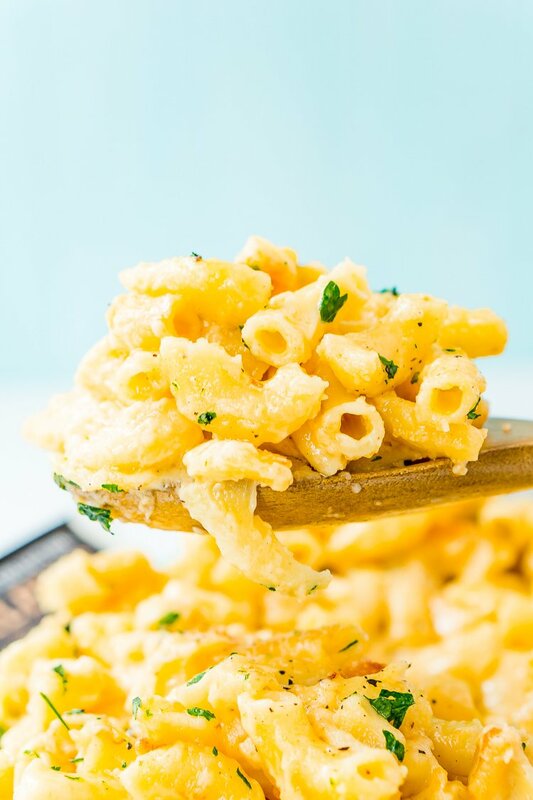 With summer drawing to a close and school getting ready to kick off again, it’s time to start thinking about cozy (and easy) dinner ideas like this Crock Pot Mac and Cheese recipe! I promise your whole family will love how creamy and gooey this mac and cheese is and YOU will love how simple it is to make! And by simple, I pretty much mean grating some delicious Cabot cheese and throwing everything in the slow cooker for an hour and a half or so. Yeah… THAT easy! JUST TAKE ME TO THE MAC AND CHEESE RECIPE ALREADY! If you’d rather skip my (very helpful, I think) tips and tricks, essential cooking info, and similar recipe ideas – and get straight to this deliciously easy CROCK POT MAC AND CHEESE Recipe – simply scroll to the bottom of the page where you can find the printable recipe card. This recipe was inspired by my recent trip to Vermont, where I teamed up with Cabot Cheese and got to learn about the farm families who own the Co-op and about the process of making this delicious cheese from cow to creamery to consumer. Growing up in rural Maine, I have a strong appreciation for farming and agriculture. 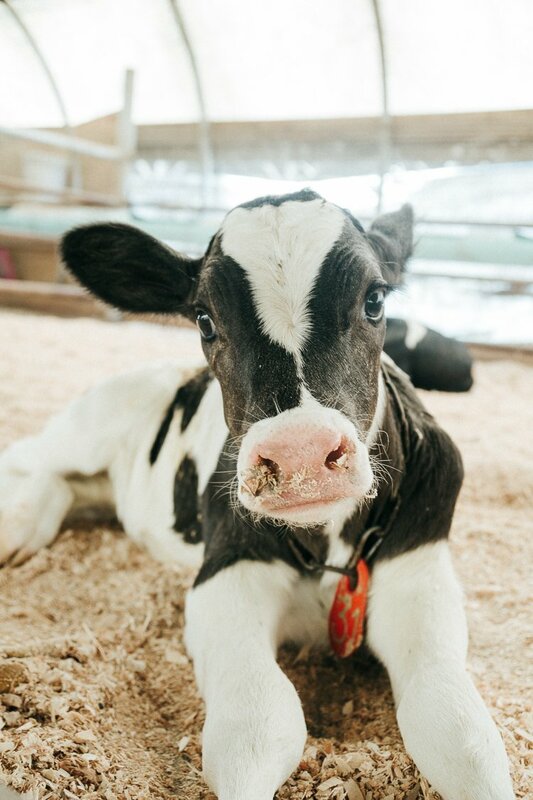 So this wasn’t my first time on a dairy farm, but my time on the Kayhart Brothers Dairy Farm in West Addison, VT was quite different than previous experiences. Kayhart Brothers Dairy is one of the largest family-run milk producers in Vermont and their farm even stretches across Lake Champlain and into Upstate New York. It was fascinating to see and learn about the technology used in such a large operation. Tim and Steve Kayhart shared their family’s story with us and gave us a tour of the farm where we got to watch the milking process and meet some of the cows. 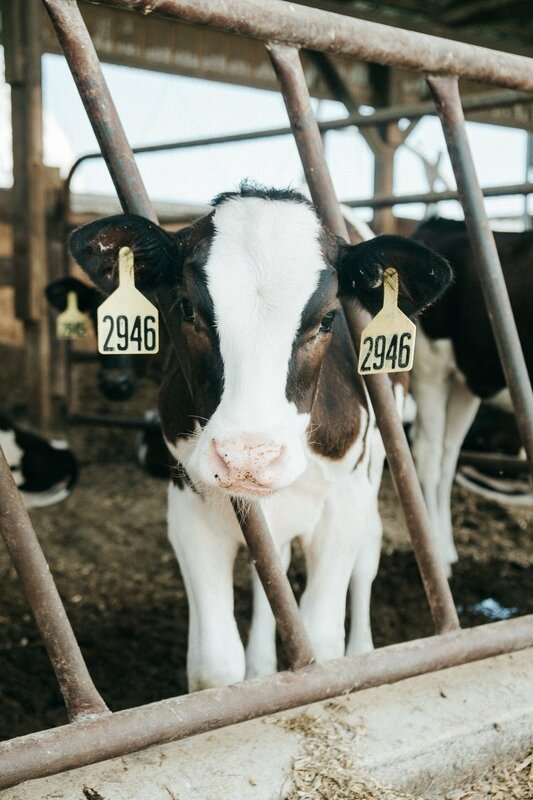 These animals were so interesting to watch as they went through the milking process and the fresh calves were so adorable! It was a really cool experience to see where our favorite cheeses come from in person! It just goes to show that the best dairy products come from the happiest and healthiest cows. But a quality dairy brand is more than cared-for cows; it’s the human employees’ dedication that also makes the best products. 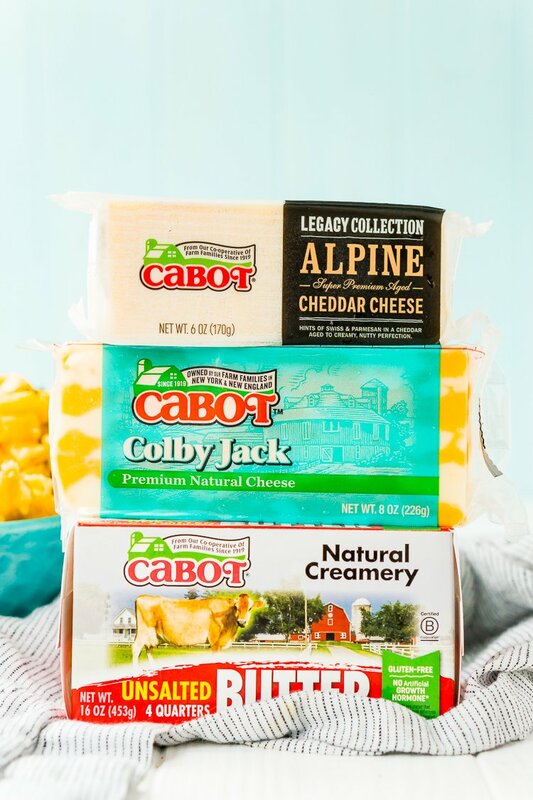 Since 1919, Cabot’s 1,000 farm families have been passionate about their cows, their craft, and of course, their cheese! In fact, this company started the world’s first dairy co-operative, and together, they work hard to continue improving upon sustainable production practices. Cabot Creamery is even a Certified B Corporation, meaning that a non-profit third party gave them this seal of approval for their high standards of social and environmental responsibility. I love that I can feel good about buying Cabot products, not to mention they’re delicious! So it’s really no wonder that I use them as the star ingredient in my Crock Pot Mac and Cheese! 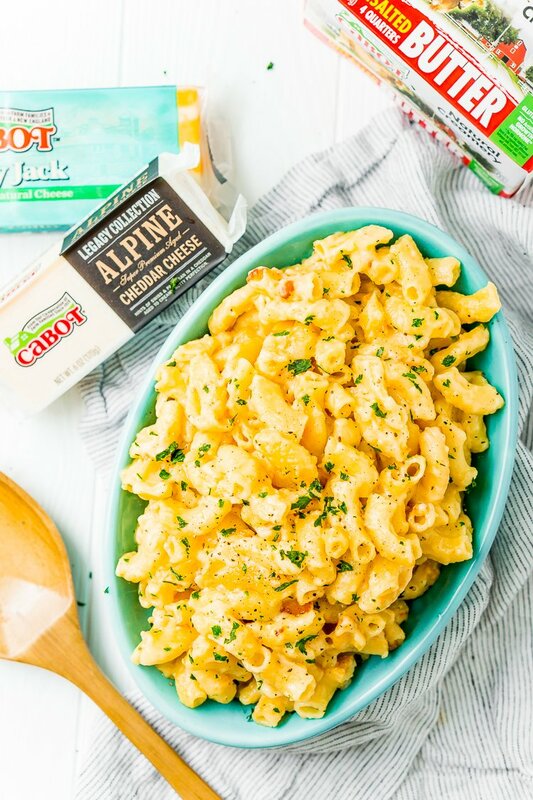 This easy, family-friendly recipe uses Cabot Alpine Cheddar, Cabot Colby Jack Cheese, and a few tablespoons of Cabot Unsalted Butter. These ingredients, plus heavy cream, whole milk, and spices make the creamy, irresistible sauce to coat the tender macaroni. Whether you need a simple dinner idea for a weeknight or you’re craving some comfort food on a chilly evening, this Crock Pot Macaroni and Cheese is decadent and satisfying. You’ll never want to eat the boxed stuff again! This is also a crowd-pleasing recipe to make and share at potlucks. Bring a crock pot full of this mac and cheese, and a scoop or two makes a mouthwatering side to any meal. 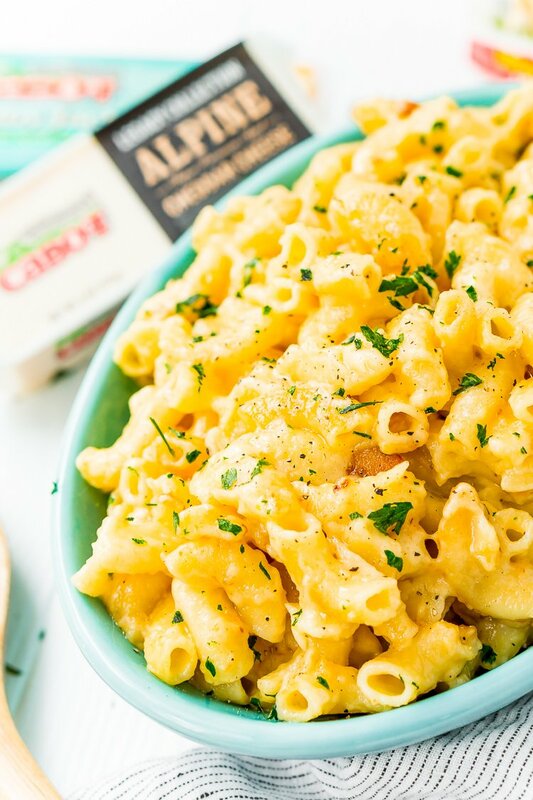 Macaroni and cheese is a classic family favorite, and this Crock Pot Mac and Cheese is easy to make and made extra delicious with two varieties of Cabot cheese! With back to school season just around the corner, keep this recipe handy for busy weeknights or lazy evenings at home! No Boiling Required! 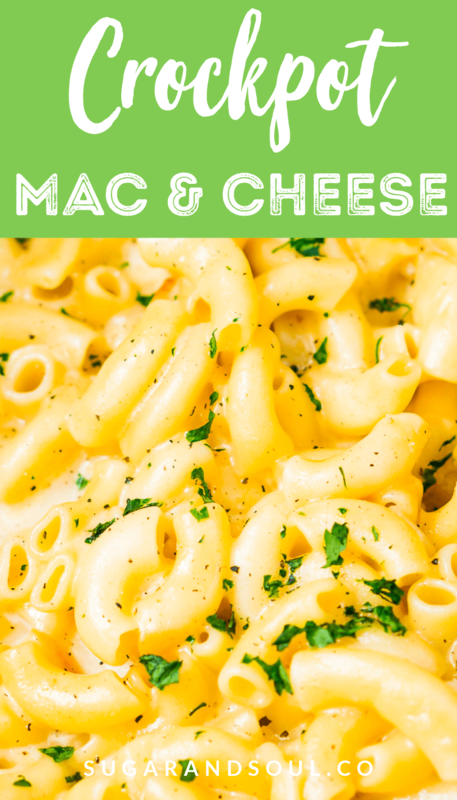 – A lot of mac and cheese recipes that are made in a slow cooker require you to pre-cook the pasta before adding it to the slow cooker, in my opinion, that kind of defeats the purpose of this easy dinner. So in this recipe, you’ll add the uncooked pasta right into the crock pot and let it fully cook in there! Plus, this means fewer dishes! It’s Quick! – You might think that because you’re making this is a slow cooker and you’re not pre-cooking the pasta that this dish would take forever to make, but it doesn’t! In fact, it only takes about 10 minutes of prep time to grate the cheese and measure the ingredients and then just 90 minutes of cook time before you can indulge in this cheesy goodness! This means it’s even great for weeknights even if you start it when you get home from work! Colby Jack! – Yes, I’m a firm believer in cheddar cheese when it comes to my mac and cheese, but I always love adding at least one other cheese variety to the mix and in this case, it was Colby Jack! A favorite of cheese-loving cooks, our yummy Lactose-Free Colby Jack is actually a blend of two of cheddar’s close relatives: Colby and Monterey Jack. You’ll see on the surface of our 8-ounce Dairy Bar that the two cheeses are marbled together in perfect harmony. 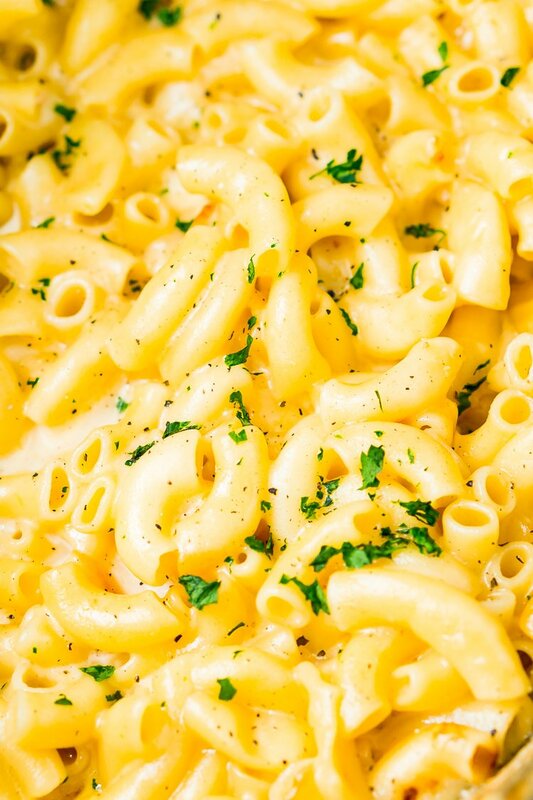 Pin this Crock Pot Mac and Cheese for Later! Add butter, cheese, cream, milk, and seasonings to a slow cooker and cook on high for 20 to 30 minutes until the cheese has mostly melted. Add in the macaroni and cook on high for an additional hour or until macaroni is tender. Stir regularly to prevent burning. What size crockpot do you cook this in? I was wondering if it could be cooked in the longer “casserole” type pots so it could travel to a pot luck? Hi Barbara, I cook mine in a standard 6 or 8 qt crockpot, but I imagine the kind you’re talking about would work just fine except that it might cook a little fast given that there is more surface area, but I’m not 100% on that as I have never used one myself. If you try it in that kind of crockpot, I would love to know how it goes! This is fantastic! I’d never made mac in cheese in the crock pot before, but now there’s no going back. 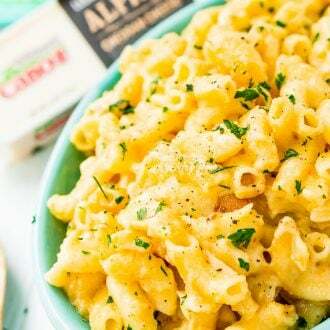 This mac and cheese is delicious, gorgeous, and SO SO easy! I had never even thought to make mac and cheese in a crock pot before, but it’s so much easier than stovetop. And YES, I’ll take ALL the Cabot Cheese! Yes, it take a little more time that stovetop, but less attention overall! Can you spray the crockpot with non stick spray so you won’t have to stir as often? Hi Tracy, Spraying the crockpot will help a little, but you will still need to stir regularly to ensure that the cheese mixes well and that the pasta cooks evenly, if left unstirred, the pasta at the top could get hot and crunchy and possible burn.